For some, Super Bowl Sunday is all about football. For us, it’s about scoring epic eats, which includes these recipes for the best, crowd-pleasing gridiron grub. Want to throw your own Super Bowl bash? Find the playbook for throwing an easy party here. Chips and cheese. Sounds pretty basic, right? Not when Chef Lisa gets her mitts on this classic combo. This easy recipe for BBQ Chicken Nachos, piled high with all the fixings (not to mention a great twist of subbing in BBQ sauce for salsa) are scrumptious. Get ready for love at first bite. 1) In a medium saucepan, combine chicken, barbeque sauce, lime juice, cumin and chili powder over medium heat. Reduce to a simmer and cook stirring occasionally for 10 minutes. Remove from heat. 2) Preheat oven to 350ºF. Line a baking sheet with aluminum foil and coat with non-stick cooking spray. 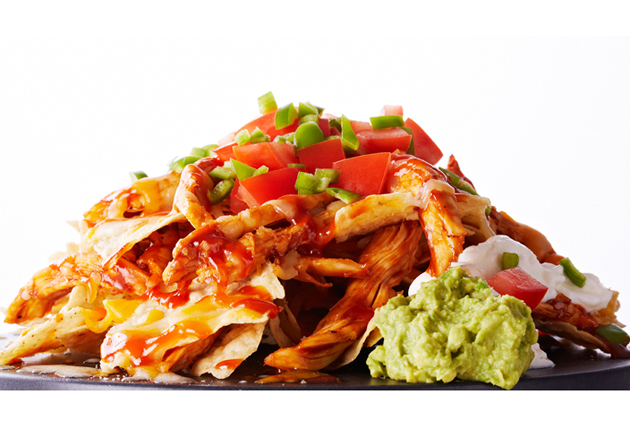 Spread a single layer of tortilla chips on the baking sheet and top with half the chicken mixture and 1¼ cups cheese. Place another layer of chips over cheese and top with remaining chicken and cheese. Bake for 10 minutes, until cheese is melted and golden brown. Garnish nachos with chopped tomatoes, jalapenos and barbeque sauce. Serve with guacamole and sour cream. Traditionally, tostadas are flat, deep-fried tortillas topped with refried beans, cheese and other fixings. tasty, but try balancing a greasy “open face” taco in one hand while not spilling your drink from the other…awkward. 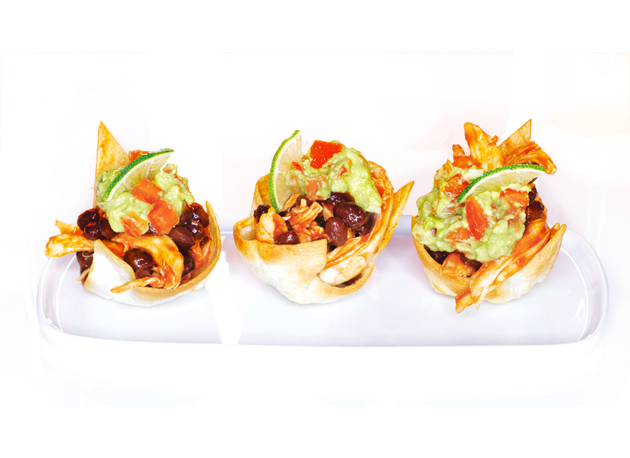 We won ‘t let your fiesta flop – these tortilla cups mounded with Mexican-spiced chicken and creamy guacamole guarantee the only thing to hit the deck will be your Corona-crocked amigos. 1) Preheat oven to 400°F. Coat a standard size muffin tin with non-stick cooking spray. 2) Brush both sides of the tortillas with olive oil and sprinkle with salt. Cut each tortilla into 8 wedges. Working in batches, mold each tortilla triangle to fit the muffin cups and bake 7-8 minutes until crisp and golden. Remove from muffin tin and set aside. 3) For the chicken, in a large pot, combine chicken breasts, onion, garlic, parsley, mint, bay leaf and salt. Add 8 cups of water and bring to a boil over high heat. Reduce heat and simmer covered for 10 minutes. Turn heat off and let sit covered an additional 10 minutes. Remove chicken from broth, allow to cool slightly and then shred chicken. 4) For the bean mixture, in a medium saucepan, heat oil over high heat. Add beans and cumin, stirring 1 minute. Add ketchup, honey, orange juice, soy sauce, sherry vinegar and chopped chipotles. Lower heat to medium and continue to cook until sauce is syrupy, about 5 minutes. Add shredded chicken, stir to coat and remove from heat. 5) For the guacamole, cut avocados in large chunks and mash in a medium bowl with a fork. Stir in tomatoes, lime juice, lemon juice, cumin, salt and cayenne pepper. 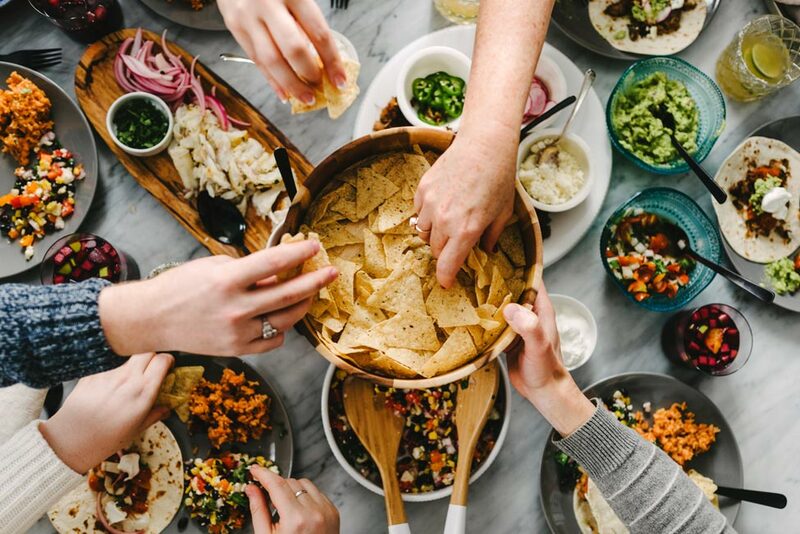 6) To assemble, top each baked tortilla cup with a heaping spoonful of the chicken and bean mixture followed by a dollop of guacamole. Serve immediately. 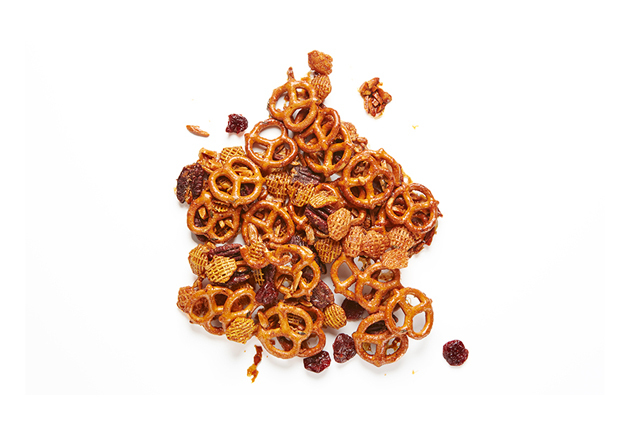 Satisfy your next snack attack with this delicious baked Sweet and Spicy Snack Mix, a crunchy combo of pecans, almonds, pretzels, cereal and dried cranberries. 1) Preheat oven to 350°F. Combine brown sugar, 1 tsp of thyme, salt, cinnamon and cayenne pepper in a small bowl. 2) Combine pecans and almond slivers on a parchment lined pan. Bake at 350°F for 9 minutes or until the nuts begin to brown. Combine the pecan mixture and butter in a medium bowl, stirring until butter melts. Gently stir in pretzels, cereal, cranberries and maple syrup. Sprinkle the sugar mixture evenly over pretzel mixture and toss gently to coat. 3) Spread pretzel mixture in a single layer on pan. Bake at 350°F for 10 minutes, stirring once. Sprinkle with the remaining tsp of thyme. Cool completely. We’ve always loved coconut shrimp, but never loved the deep fried effect – greasy fingers and stomach aches – that ensued. 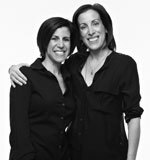 Now, thanks to this recipe, we can now enjoy these delicious delights, guilt-free! 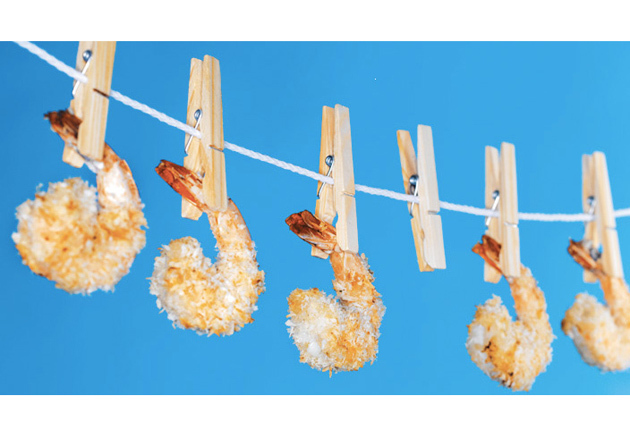 Coated in a coconut crust, juicy shrimp are baked until golden brown and dipped in a sweet apricot sauce. 1) Preheat oven to 425°F. Line a large baking sheet with aluminum foil and coat with non-stick cooking spray. 2) For the shrimp, pour honey in a medium bowl and warm on high in the microwave, 20-25 seconds. 3) On a large plate, combine panko, coconut, cumin, salt and pepper. 4) Taking shrimp one at a time, dip in honey and then coat in coconut mixture. Place on prepared baking sheet and bake 14 minutes, gently flipping shrimp halfway through baking. 5) For the sauce, place jam in a medium bowl. Warm in the microwave for 45 seconds. Add chili sauce and Dijon mustard, stirring to combine. Serve with baked coconut shrimp. Looking for the perfect one-biter? 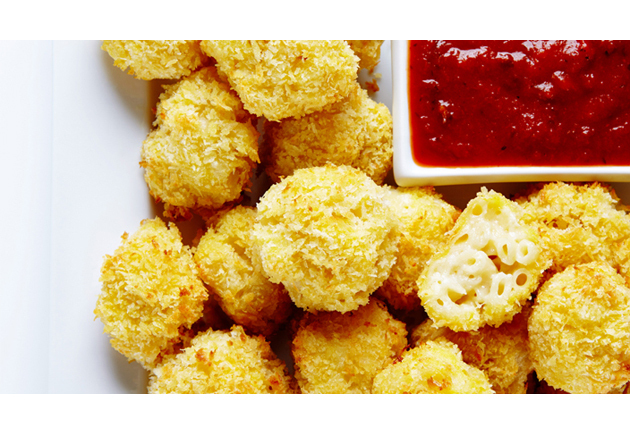 These Macaroni and Cheese Bites, balls of cheesy noodle greatness, are coated in breadcrumbs and baked to golden perfection. 1) In a large pot of lightly salted boiling water, cook macaroni noodles until tender. Drain, rinse and set aside. 2) For the cheese mixture, in a large pot, melt butter over medium heat. Whisk in flour, stirring continuously for 2 minutes, making sure it’s free of lumps. Add milk and half and half, slowly continuing to whisk. Increase heat to high and bring to a boil. Reduce heat to a simmer and cook mixture for 10 minutes, whisking frequently. Remove from heat and stir in white cheddar, Gruyère cheese, Parmesan cheese and salt. Fold the cooked macaroni noodles into the cheese mixture. Cool to room temperature and then cover and refrigerate at least one hour. 3) To assemble, scoop a heaping tablespoon of macaroni and roll into a tightly packed ball. Place on a parchment-lined baking sheet. Once all the macaroni has been rolled, place in freezer for 20 minutes to firm up. 4) Preheat oven to 425ºF. Place a baking rack on a baking sheet and coat the rack with non-stick cooking spray. Place flour and salt in a small bowl. Place eggs in a second bowl and panko breadcrumbs tossed with the olive oil in a third bowl. Dip macaroni balls in the flour, shaking off excess flour, then dip into eggs and then the panko mixture, patting crumbs to adhere. Place on baking rack and bake 15 minutes until golden brown. If desired, serve with marinara sauce for dipping. Serve immediately. 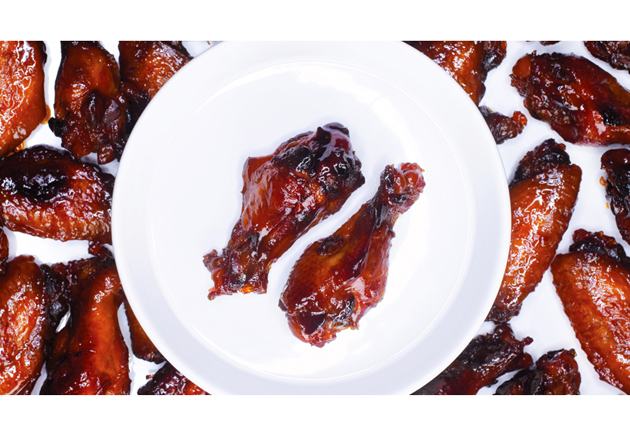 And, if we might amend that definition, it involves intensely gooey, honey-soy chicken wings. They are best shared with those who do not ask where they can find moist towelettes. 1) Coat a 13×9-inch baking dish with non-stick cooking spray. Place the wings in the dish and set aside. 2) In a small saucepan, combine honey, soy sauce, brown sugar, ketchup, chili sauce, garlic powder and ginger. Bring to a boil over medium-high heat. Once boiling, pour honey mixture over chicken wings. Cover and marinate in refrigerator for a few hours or overnight. 3) Preheat oven to 375°F. 4) Remove wings from refrigerator and cover with aluminum foil. Bake in marinade for 55 minutes, stirring occasionally. Remove foil cover and bake wings for an additional 15 minutes or until sauce is thickened. Want the perfect cocktail party conversation starter? 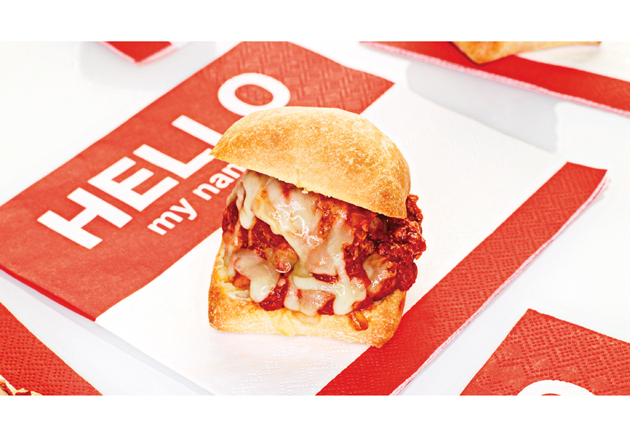 These Meatball Sliders will do all the talking…”Yum, yum, yum…” Smothered in a homemade, hearty tomato sauce and sandwiched between melted mozzarella, parmesan and soft buns, these Meatball Sliders will leave everyone speechless. 1) For the tomato sauce, in a large saucepan, heat olive oil over medium heat. Add onion, salt and pepper, cooking 5 minutes until softened. Add garlic and cook 30 seconds stirring constantly. Add tin of crushed tomatoes, tin of diced tomatoes and oregano. Turn heat to low and simmer 15 minutes. 2) For the meatballs, in a medium bowl, combine bread and milk, letting it stand for a few minutes. Add ground beef, garlic, egg, Parmesan, basil, salt and pepper. Mix with hands, just until combined. Roll mixture into about 20 meatballs the size of golf balls. Drop meatballs into prepared sauce and bring to a gentle simmer over medium-low heat for 30 minutes, until meatballs are cooked through. 3) To assemble the meatball subs, preheat oven to 400°F. Line a baking sheet with aluminum foil and coat with non-stick cooking spray. Arrange rolls on tray with the cut side up. Place 1 meatball on half of each roll, add a spoonful of sauce on top of the meatball and a tablespoon of mozzarella cheese. On the other half of the bun, put a small spoonful of sauce and 1 tsp of Parmesan cheese. Repeat with remaining meatballs. Bake 3 minutes or until cheese melts. Sandwich together and serve.